The 9335VS is a collaboration between international trumpet soloist Allen Vizzutti and Bob Malone. The 9335VS features a .459-inch bore with a 4.9-inch yellow brass bell with variable wall thickness for an impressive response. 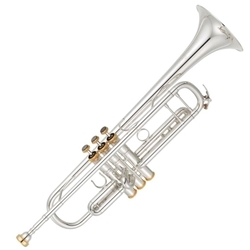 The 9335VS also features brass valve stems, grey pearl finger buttons and a third valve slide stop screw with a solid screw head to add to the overall feel and response of the trumpet.